First-the BEST news…Gabriel is officially down to 1-YES 1. 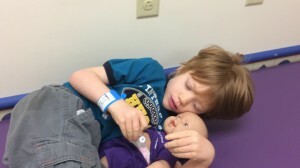 Medication to control his seizures! In the last 2 years he has been on as many as 4 at a time (not including the diet!). So as of October we have weaned off the diet and 3 medications! AND NO Seizures! YIPPEE! This last wean has been tough. G’s emotions are all over the place (especially inconsolably sad) and we are having to be careful to keep him safe. At the same time he has been better at communicating. He is singing FULL songs again (instead of only one line) and tons of other good stuff. I am so glad the seizures have stayed away for so long but the reality is there are many health concerns that have come as result of this syndrome and the seizures could come back at any time. Right now we are focusing on muscle tone and coordination issues. We are focusing on his chewing and swallowing muscles a lot in Occupational Therapy. It was surprising to me that epilepsy could cause eating issues, that lead to aspiration, chronic congestion and pneumonia! We are blessed to have great medical professional working with us to help find solutions! Gabriel is scheduled to have a G-tube inserted on Monday. We are excited and nervous about the procedure. We are excited because it will give us good options for making sure he gets both nutrition and medication that do not rely on weak muscles to do all the work. We are nervous because it is surgery, under general anathesia. Along with the normal concerns anathesia can cause seizures–either right away or as an after effect. All of the pre-op appointments have been wonderful. We met with the surgeon, he was very nice! Kind, compassionate and patient. They used us the device Gabriel will have. It is called a Mic-Key. They had a special dolly that we got to practice using the MIc-Key with. Gabriel especially like this. Please pray for a smooth surgery with no complications and no seizures. Pray that Gabriel does not fixate on the Mic-Key and try to pull on it. Pray for us to peace while Gabriel is in surgery and away from us.